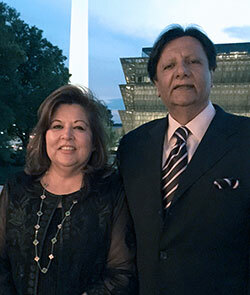 Rafat “Ray” and Shaista Mahmood, Mahmood Investment Corp.; excerpted from an interview with Bill Yeingst of the National Museum of American History, October 26, 2014. Ray: I was born in Karachi, Pakistan. My father was in the foreign service and transferred to London. So we were there for a little more than five years, and then returned to Karachi. It was a bit of a change for me, going from London to Karachi, because I didn’t know the language. I could not read or write it, so there were some difficulties in school. Then we went to Washington, D.C., for about five years, and I was in school there. And coming from Pakistan to Washington was also a big change. After high school my father transferred back, and I went back with them and went to Lahore University. Lahore was where Shaista used to live, and her parents were there, and I used to go to their home quite often and meet with her parents, meet with Shaista. After graduating from college, my father said, “What are you going to do now?” And I said, “I want to go back to the United States.” He said, “You know it’s going to be difficult.” Sending money from Pakistan is very expensive because of the currency rates. So I said to my father, “Well, if you can just get me a ticket and a couple of hundred dollars, I’ll figure out what to do after that.” I was confident when I came to the United States. When I was in high school I was working, and I changed jobs, so I knew jobs were easy to find. Yes, they were not high paying jobs; they were not jobs that you want to make a career out of. But they were something where you could at least pay your bills and you can survive and go to school at night. My father and Shasta’s father were in school together in college, and they were friends. So he called Shasta’s father and said, “My son is getting ready to go to the United States. I would like to see him get engaged before he goes. And he’s shown interest in your daughter. What do you think?” So he said, “Well, I’ll talk to Shaista about it. I don’t see any problems.” That was the conversation. The next day, Shaista’s father had called back to my father and said yes. One restaurant [in Washington, D.C.] had a sign that said, “Help wanted: Cashier.” I got [the] job the next day, and I applied to the USDA Graduate School to take graduate classes—economics, import/export, and things like that. I was doing my jobs and going to school, and this gas station came up for sale in Virginia, [in] not such a good area at that time. The district manager said to me, “Well, it’s a difficult location. It’s been closed a few times. Do you still want it?” And I said yes. I went to training for three or four weeks, then came back and purchased this gas station. There was a law at that time that if you’d invested a certain amount of money in a business, you could apply for a green card. So I hired a lawyer, and we filed for the green card in 1976. And then I went to Pakistan, and Shaista’s parents and my parents finalized the date for a wedding. My father was not a very religious person, but he always believed in doing the right things. He always said to us, “Do the right things. Be a good person. Don’t discriminate against anybody because of religion or because of their wealth.” And I think those were some of the greatest lessons that I’ve had from my father. I used to see his work ethics. Throughout our life, I’ve seen him work. His work ethics were really fierce. Shaista: I was born in Karachi. My father was working with police in Karachi, I think. The partition had a big impact on all our families. I heard the stories about 1947, the partition. That was the biggest scar on my family. And that’s because it was a huge change for the whole family. I remember my mother said that somebody told us, “You have to leave in an hour. You have to leave, pack up, otherwise people will come and they will now kill you, the whole family.” Our neighbors were all Hindu, they were all Sikhs, and we were like a family. We used to celebrate Diwali; they used to come to our house, we used to celebrate Eid. We were kind of a very tight community in India. And suddenly when we hear this—that we have to leave our house in an hour. We were all kind of shocked. What’s happening here? We [my grandparents] came to Lahore. We [our family] started our life again from the scratch. We didn’t have anything. No money, nothing. My father’s family also migrated from India. And they lived in a village. My father got his bachelor’s in India. He got married to my mother. He went to London, he did his barristership, he came back. And it is so strange—when he came back he didn’t practice law. He found another good opportunity. At that time there were about five hotels in Pakistan called Oberon. He became the head of all these hotels, and that’s where I remember growing up in hotels. My father and mother, they had a nice life in Lahore and could say that they were quite broad-minded, and they really wanted to give their children an education. When I got married and I came here, [there] was not much difficulty for me to adjust because I remember watching my father. He was very open-minded, and that’s how I grew up in Pakistan. You know, I had a picture of Elvis in my closet! Religion was part of me, I would say, because I studied religion. I studied Urdu, which I love. It was a beautiful language. Also English and Persian. Religion is something that really gives us comfort. I used to pray—not five times, but whenever I got a chance. And I used to fast in Pakistan, and we used to celebrate Ramadan with our cousins, with our families. And Eid is very special. So the life in Pakistan was very nice, and my experience here in America was also very nice. I came here April 18, 1976, after getting married. And the first time I saw New York, I said, “Oh my god, I don’t want to live here.” It was not the city for me. He took me to McDonald’s; I didn’t like McDonald’s. And he said, “Okay; let me take you someplace else.” So he took me to a pizza shop. And I said, “Oh, I like this.” I still remember my first time coming to Washington. It was in the late afternoon, and we had taken the Eastern shuttle flight from New York to Washington. And the day was very clear, and I remember landing in Washington. “Oh my god,” I said, “I can live here. This is the city I really want to live.” And I have learned so much from people here. People here are such good people. We always have good neighbors. We have American friends all over. Ray: I think one of the biggest things that we feel with our children is that we still have a mindset of how we were brought up, and the values and the cultures. But since these children grew up in this country, there’s sort of a clash of those things. Most of the time, they see themselves as Americans. And every now and then, when they would see in the media something that would just generalize all Muslims—that’s when these kids would say, we are American Muslims. And why do people say things like that? That’s a concern that comes to their mind. But what I see with this generation, not just our children, but all the kids in the United States, whether they’re white or African-Americans, or Greek, or whatever they are –they don’t have any barriers. And they don’t look at people as being a Christian, a Muslim, a Jew, an Atheist. They’re just friends with everybody, and they don’t look at black, white, all this. And that’s a very positive sign. I think that—for the future of the world, I think that’s a great thing. We are always trying to improve relationships. We’ve – many times had Indian ambassadors, Pakistan ambassadors here together for different events. We continue working with our senators, and the ambassadors that come from Pakistan. Regardless of which government is in power in Pakistan, we just wanted to help, because facts get distorted. They’re not understood by people here, and then they’re not understood by people there. We do our Interfaith Iftar that we’ve been doing for the last 14 years. We bring in friends from the Christian community, the Jewish community, the Muslim communities, and then we try to bring somebody in from the government. We just like to show these people that, in this country, we want to get along with everybody. It doesn’t matter religion, it doesn’t matter what ethnicity they are. So we’ve been promoting this kind of things for years, and we will continue doing this. This is our objective. Shaista: Yes, I was born in Pakistan, but this is my country, and this is home. And I am so proud to be an American, because we are doing such good work. There’s a lot of wealth in Pakistan, but their giving is not what we give here. We Americans are really giving, and we really want to help others. We should be proud of ourselves.